The BEST Cream Cheese Frosting (+ Video) - Dessert Now, Dinner Later! The BEST Cream Cheese Frosting – thick, sturdy, and pipeable, plus not overly sweet! Okay ya’ll! I’m serious when I say this is the BEST Cream Cheese Frosting recipe out there! I’ve tried so many kinds, and they work out okay, but I’ve always struggled with soft, stringy frosting. This cream cheese frosting is stiff, sturdy, pipe-able, spreadable, you name it! It’s not overly sweet like the other recipes either. See the ripples in that frosting? Yep, that’s proof right there that it’s stiff enough to decorate with. The big difference between this recipe and all those other ones floating around the web, is that this recipe uses more butter and less powdered sugar. This variation of more butter and less powdered sugar gives the cream cheese frosting a buttery, creamy texture, yet still has that tangy cream cheese flavor to it. Less powdered sugar helps it not be stringy, and the butter helps lighten and fluff up the frosting. 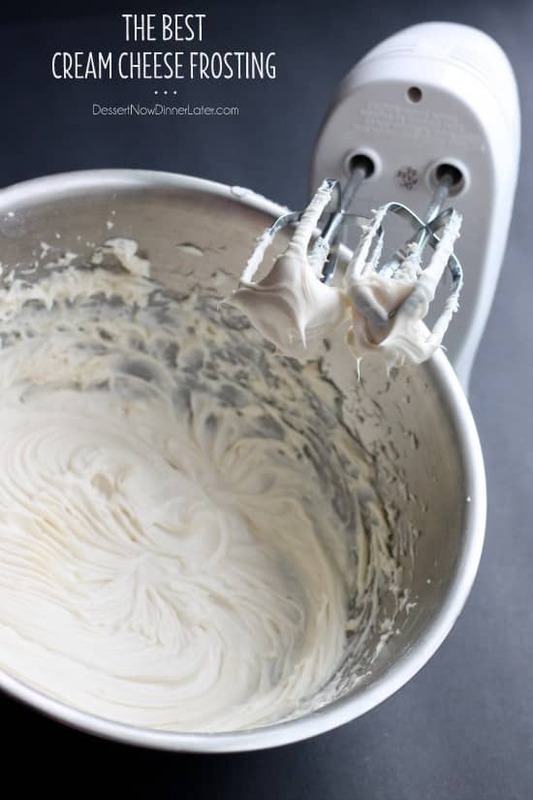 This is seriously my go-to cream cheese frosting recipe now. 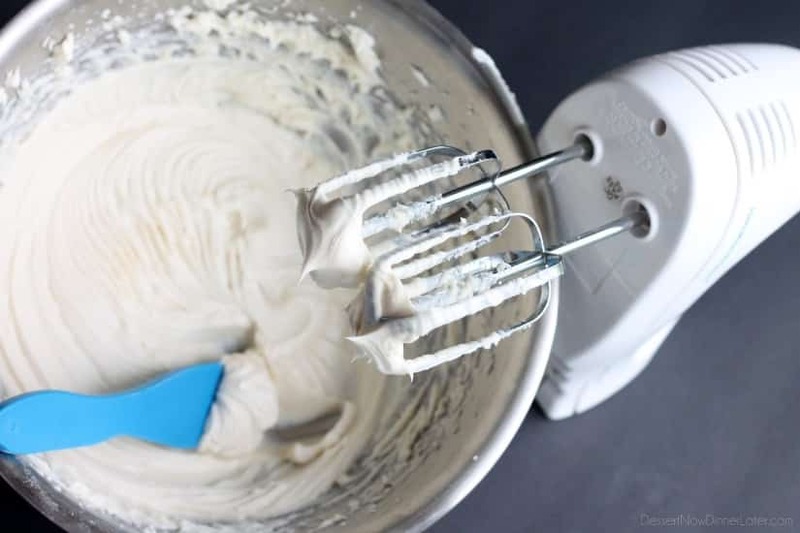 I will not use any other cream cheese frosting recipe in the future, so I am sharing this recipe, separately, in it’s own post, so you can refer to this post as often as I make this frosting in my culinary creations! Have you tried it this way yet? Make this ASAP! Try my Chocolate Cream Cheese Frosting too! Place the cream cheese in a mixing bowl. Using a hand mixer, beat until smooth. Gradually add the butter 2 Tablespoons at a time, and continue beating until smooth and well blended. Add powdered sugar and vanilla all at once. Blend until combined and smooth. (Don't beat too long or the frosting will be too soft to pipe. If this happens, place the frosting in the refrigerator or freezer until it firms back up.) Use for any recipe that calls for cream cheese frosting. *Makes 1 1/2 cups of frosting which will frost about 12-14 cupcakes. *You can store this frosting either at room temperature (which is 70 degrees Fahrenheit) or in the refrigerator. Do not go back and forth storing from one to the other, for food safety reasons. Use your own judgement. Extra pictures and video added 4/1/17. Instead of vanilla, use fresh lemon juice. This will help keep the tang of the cream cheese. You can add more lemon juice to suit your taste. That’s a nice tip, thanks for sharing! I am going to make this & put in mint extract in place of vanilla. Then frost a chocolate cake with mint chips. Hope it turns out as good as it sounds! I totalky love this recipie better. I like how this rcipie is more creamy and less sweet the other recipie was way too sweet this one is just right my kids love the frosting and licking the beaters. Thanks for your feedback Leslie! Glad you liked it so much! How long is this icing good for? How far in advance can I make this? I would say 1 week in the refrigerator. You may need to re-whip it a little bit if it releases some liquid/separates at all. I love cream cheese frosting….even on graham crackers! I will pin this recipe and make it the next time I have a craving for cream cheese frosting. Thanks! I try not to make cream cheese frosting too often because I could totally see myself finding anything to spread it on. Haha. 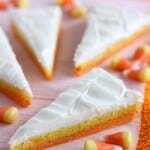 Love the graham cracker idea! I love this picture! Makes me want to lick the beaters. 🙂 I personally love vanilla in my cream cheese frosting! Oh I totally lick the beaters! And I love vanilla in my frosting too! My husband gets to lick all the good recipe beaters and and scrape the bowls clean, then he gets to clean up and dishes. Good trade off don’t you think. Haha! For sure! My husband helps do dishes even when he misses out on the licks, but he’s awesome like that! This should be a staple in any home! The recipe I use is very similar to this, but I add a tiny dash of lemon juice. I seriously just want to eat a spoonful for breakfast! I’m seriously intrigued by the lemon juice! Lemon extract works better. Lemon juice in the icing can make it spoiler quicker. I really love that you are willing to share your knowledge about recipes and also HOW TO MAKE THINGS LOOK REALLY PRETTY. Too many people who have this kind of knowledge like to keep it all to themselves. Grateful your not like that! I follow your blog on a regular basis! Thank you Jan! I really do want to share what I know with my readers! Why not?! Thanks for following along! A good cream cheese frosting recipe is always good to have around! Thanks! Makes a great treat as the filler for a sponge cake pumpkin roll and by adding a shot of white rum (or rum flavoring) steps it up to pleasing without being a no-no. Oh my heck, anything! Did you see the comment about graham crackers! I die! I am going to try your cream cheese recipe…it will be awesome I know . Can’t wait to see your other recipes. Cream cheese frosting is my favorite! This looks perfect! Mrs. Davis, An authentic Black Forest is frosted with a Kirsch Whipped Cream. I got a gold medal, and Best of Show Trophy, with my Black Forest Cake. A whipped cream will not hold up much beyond refrigeration, so when my GM, at Ramada Inn, asked me to put a Black Forest Cake on the Dessert Cart (I was the Pastry Chef at our Ramada Inn for a few years), I used a Kirsch Mock Whip Frosting. A Mock Whip Frosting is the texture of a Chantilly Whipped Cream. It held up great the entire time it was on the Dessert Cart. It’s usually filled with dark cherries, pitted, cut in half, and macerated in a Kirsch Simple Syrup. I decorated it with 3D little trees made with melted dark chocolate. Cream Cheese Frosting does not belong on a Black Forest Cake, nor does it belong on a Red Velvet Cake. The original, authentic frosting for that is an Ermine Buttercream. Hope this helps. Cream cheese frosting is my fav, love it! Thanks for sharing with all of us. I plan on making a butter pecan layer cake using two 8 or 9 inch pans. Will this make enough frosting? I live in Philly so I automatically love cream cheese! That sounds like a great idea! I would double the recipe for 3 cups of frosting especially since it’s a layered cake. Be refrigerated when they have cream cheese frosting on them? Thanks! Cream cheese frosting is one of those things that can be either or but not both. Once you make it, you either leave it at room temperature or keep it refrigerated. It’s when you move it back and forth from room temperature to a cold refrigerator that it might not be safe to eat anymore. I have mostly kept this frosting at room temperature because I put it in cookies, cakes, or on cinnamon rolls. Hi there, has anyone made this and been able to pipe with it? 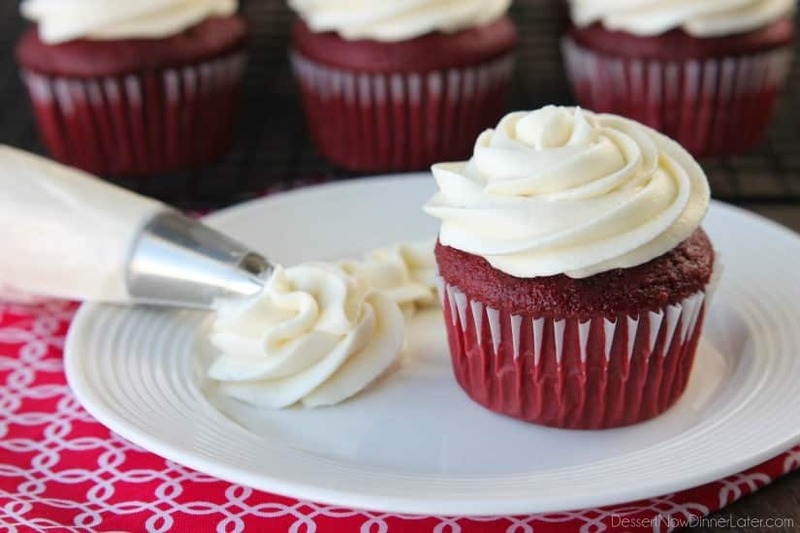 As in make swirls on top of cupcakes that actually look like swirls, not a gloomy mess like I always seem to end up with… I have been searching for years it seems for a pipeable cream cheese frosting and every recipe I have tried is far too runny – does anyone know how well this pipes or do you have a photo? Or you can check out another cookie I used it to pipe on top of in my instagram post. I’m so glad to hear that Shana! Would this work on cutout sugar cookies? I don’t like royal icing and i can never seem to find a good frosting for this type of cookie? I hate buttercream, so I always use Cream Cheese Frosting. Hi there, Do you use clear or brown vanilla? I only have the brown one, will this make the icing a cream colour instead of nice and white? Thanks. I totally use regular vanilla (brown) and it looks as white as the images show. can this work with regular sugar instead of powdered? Probably not. Powdered sugar is much lighter in texture and helps keep the frosting fluffy. If you used granulated (regular) sugar instead it would be dense and heavy and the sugar might not dissolve completely leaving you with a grainy frosting. I am trying this looks great! I am doing some red velvet cupcakes. Do you know about how much frosting I need for 24 cupcakes. I would definitely double this recipe. It depends on how high you pipe the frosting. If you like lots of frosting, triple this recipe, if you like a mild coating, doubling the recipe should be sufficient. I need 24 cupcakes . Liz HEY Liz hey amber thanks these are great ! Hi Taylor, I’m not sure I understand your question. This is stiff enough to pipe and decorate things, are you having problems? Didn’t work for me. I used regular Philadelphia creamcheese and I followed the recipe step by step. It tastes really (I mean: really!) great but it’s way too runny. I used a stand mixer instead of the hand mixer. Could this be the reason I failed? I have no idea why it would be runny. The only liquid is 1 tsp vanilla. The hand mixer does work much better for this recipe than a stand mixer. Did you use a whisk or paddle attachment? I honestly can’t think of any reason for it to be runny unless you added more powdered sugar than called for. That makes cream cheese frosting stringy and hard to work with. Sorry! Amber, I’ve tried again with the paddle attachment (used whisk at the first attempt) with a little less sugar and it turned out great! Thanks for sharing your recipe! Oh good! Phew! I was so perplexed about what could have gone wrong the first time. Glad you got it to work out! I want to start off by saying, that I NEVER leave comments on blog posts. I am a wife, mother, and crocheter, and I link up to A TON of blogs on a daily basis to help “satisfy my needs and wants”. However, nothing ever HITS HOME and “knocks my socks” off enough to even think about leaving a comment. So you know you either have done something really AWFUL, or REALLY GREAT, for me to be taking the time to write you. Today is my husbands 39th birthday, and our 5-and-a-half-year-old decided this morning on the way out of the door to school that he HAD to make daddy cupcakes for his birthday and use his new cook tools that Santa brought him for Christmas (not sure if this was more of a good gesture for daddy, or for himself!). I have recently had to come out of work as a nurse (I had a stroke this past September, 3 months before my 25th birthday) so our 2 income household went to 1 overnight. I have done a lot of research on how to cut back on spending, especially when it comes to groceries. Of course, today was the day where cupcakes were NEEDED and there is $0.01 in my bank account and absolutely no cake mix or icing in the house (GO FIGURE!!). I took to Pintrest in a hurry and found a “from scratch” basic cake recipe (shew! I am SAVED, or so I thought.). No matter how cute this 5 year old is, cupcakes with NO icing just would not have cut it. So I took to Pintrest yet again, with the few ingredients I had on hand: enough cream cheese to make it to Rome and back . . . and that was it. Is it frowned upon to slap plain cream cheese on cupcakes?. . . no amount of red sugared sprinkles was going to make that okay. So, I started looking for cream cheese icing recipes. . . low and behold, I came across yours. . . So I dug through the couches in the house and “robbed” my child’s well funded piggy bank (still haven’t figured out where all of it came from! ), ran to the dollar store and back home I was. . .
Now, let me say, that for the past 6 years, and a lot of baking under my belt, I have YET to find a cream cheese recipe I would feed to the dog, much less feed my family or guests. . . It was always either too sweet, too runny, too “cheesy”, nothing that I would make 2 times in a row. . . However, as your recipe sits in the kitchen aid, I am sitting here contemplating whether or not eating it with a spoon would be frowned upon, because my finger can not take much more “sticking and licking”. Thank you, thank you, thank you, for saving daddy’s birthday, and from the shaming and time out that was to come, had I NOT pulled this one out of the bag. You SAVED the birthday!!! Haha!!! Totally didn’t mean to scare you! My momma always taught me if I didn’t have anything nice to say, not to say anything at all! Does this make enough to ice a 2 layer cake? I am using a hello kitty cake pan, and I wanted to make it a 2 layer cake with some frosting in between. Do you think I would need to double it? It makes 1 1/2 cups of frosting. I would double it for sure. Most 2 layer cakes need 3 cups. Sounds like a fun cake! Good luck! Is this enough for 24 cupcakes? Definitely double the recipe for 24 cupcakes. It’s just barely off-white with the butter. I actually just finished making this with coconut extract for another recipe, but you could substitute Crisco. Crisco is used in many buttercream frostings, so the texture should work just fine. It won’t have the buttery taste though. If you have butter extract you can put 1 tsp in, or just go without it. Good luck! Hi Amber ..ur cream cheese frosting is delicious ..but definitely not “pipeable” which is kind of a drag since it is midnight & I dont gave any more cream cheese to make another recipe & I am in charge of bringing the super bowl decorated cake ! Try putting it in the refrigerator for a couple hours and see if that helps stiffen it enough to pipe. I use this recipe all the time with no problems. Sorry! I made this for a cake that we had on Super Bowl Sunday…I thought it was a little odd that it had no milk in it and wasn’t sure it was going to turn out…but it was perfect and yummy. I hate frostings that are over-powered by powdered sugar…this one so wasn’t. It had a lovely sweet cream cheese-y flavor 🙂 Will definitely make it again. Printed it out and put it in the family cookbook! Oh I am so glad you like it as much as we do! I seriously use it EVERY time I make cream cheese frosting! It’s my favorite! Hi Amber, let me tell you something, I read this recipe and I tell myself “I really have to do it!” it is absolutely delicious! Is now on my favorite recipes, thanks for sharing it! Yay! I made it again just last week myself! I just love it! Thanks for your review! Awesome! Glad I’m not the only one addicted to it! This is delicious and I was able to pipe with it. I could tell that with my amateur skills I wouldn’t be able to do tall bakery swirls on the cupcakes (it is a softer frosting), so I did the reverse (start in the center and move out) — rosettes — and they came out wonderful. Thank you! So happy to find your blog through this recipe; looks like you have tons of great stuff. I’ve been pinning away. That’s so great Stacey! Some days my frosting is a little soft too, but I’ve always been able to pipe with it. Glad you were able to do rosettes, and thanks for pinning my recipes! Can you sub regular salted butter instead? I don’t have any unsalted on hand. I don’t think it would change the flavor much but what do you think? For sure Callie! I prefer unsalted butter so I can control the amount of salt in my culinary creations, but salted butter would work just fine in this recipe. Enjoy! Will it work with marigerine instead of butter? I haven’t tried it. I actually never use margarine in any of my recipes, just real butter. The texture might not hold up as well, but you can try it. Hi Amber. I’m not one to leave comments on blog, but I wanted to stop by and say a HUGE Thank You for this recipe. As I sit here on a snowy Louisiana day (which is a rare occurrence), I decided I wanted to bake some cupcakes. After 30 minutes worth of research to find the perfect cream cheese icing, I stumbled across your page. It is absolutely to die for. I did, as some of the ladies suggested, add about a teaspoon or so of lemon juice just to “brighten up” the icing. It did get slightly softer, but still pipe-able. I’m pretty sure I should have quadrupled this recipe, since I can’t keep my fingers out of it. 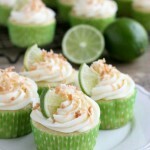 This will be my newest go-to recipe anytime I’m in the need of icing of any sort. Thanks for your kind words and for your review! So glad it worked out the way you wanted it to! We definitely frequent this recipe A LOT! How do you think this frosting will work on a tiered red velvet wedding cake? It depends on how warm it is where it will be made and displayed. I would try it out on a small cake first, to see how you like it and then decide. I have never had problems with it, but better to do a test run, just in case. I decided to go for it! I like it so far, I’ll be using dowels for strength and stability. I used orange and lemon zest for added flavor and since there is no added liquid the consistency held up nicely. I chilled the cakes and icing prior to using it. Thanks for the great recipe! I’m so glad it’s holding up and I love that you added zest to it! I just wanted you to know I will be trying this today! I’ve tried a few cream cheese frostings before, but they’re usually too sweet or just not right! I’m making a red velvet cake today and I will let you know how it goes!!! Thank you for sharing though.. I’m excited to try it! Do you have any buttercream frosting recipes? I’ve been searching around trying to find one of those that isn’t too sweet as well! I hope it went over well Amanda! I’m not a huge buttercream lover, so I don’t have a great recipe on my site for that yet. I will keep that in mind for a future post though! Hi Amber, Will this frosting pipe basket weave? And would it help to stiffen frosting by adding tsp meringue? Hi Penny, sorry for the delayed response. I have no problems piping with it, unless it gets too warm in the bag from my hands. You can absolutely try adding the meringue powder to see if that will make an undeniably pipe-able frosting. I might also suggest using some unflavored gelatin powder like you would for a stabilized whipped cream. I would love to hear if it turns out! Thanks! tried this and this is my favorite cream chesse recepi so far! That’s so great! I’m so glad you liked it! First, let me say that this cream cheese frosting is perfection itself! I first made this in January for my mom’s birthday. I frosted a dark chocolate fudge cake with it and it was out of this world delicious! I almost got a big head when everyone at the party raved about it! And to think I was nervous about making it for the first time! How about a chocolate version? Ideas? are softened just right, magic happens! Wow, that sounds amazing to pair it with a dark chocolate fudge cake! Thanks for your review Gia! As for a chocolate version, you can always try adding 1 or 2 Tbsp of cocoa powder with the powdered sugar. I haven’t tried that yet, but I don’t think it will effect the texture. Hi Amber. Do you think it would work with some strawberry juice in place of vanilla? This recipe looks great! Hi Pippa! You could try it. I’m afraid you won’t get a ton of strawberry flavor unless you add a lot and that would make the frosting pretty soft. If you are just frosting a sheet cake, you would be okay, but to use it for piping frosting on a cupcake, probably not. Good luck! Yep, the extra liquid just doesn’t do well with the cream cheese frostings for some reason. Glad you enjoyed the original recipe! It’s one of our favorite, most used frostings for sure! Just make this frosting! 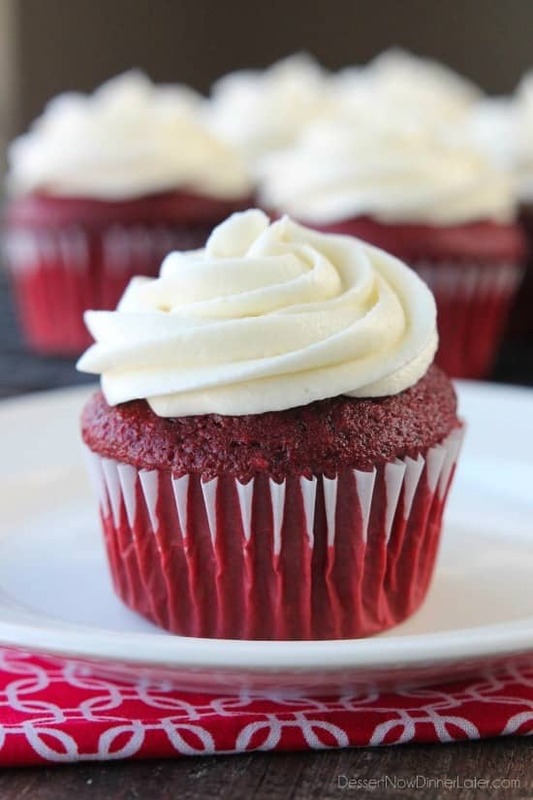 My husband had eaten some red velvet cupcakes with cream cheese frosting from a lady next door to my mom and raved about it…..so not to be undone I went looking for a cream cheese recipe and found yours. I made it and he is the happiest husband ever, even says yours is better than my mom’s next door neighbor. Thanks so much for sharing. That’s AWESOME! So glad you enjoyed it! It really is the best recipe! Can you freeze the cupcakes with the icing on? I would freeze them separately to ensure the best quality. Have a carrot cake in the oven for our Easter dessert, and realized I had too little powdered sugar to make my usual cream cheese frosting. This is the first recipe I clicked on while Googling, and it was perfect timing! Your recipe turned out great, and it’s much better tasting than the one I’ve been making for over 30 years. Thank you! Aw this makes me so happy! Thanks for your review Katherine! Glad it was a hit! Darn! Be sure to mix it really well with the hand mixer until you see absolutely no lumps and then add the powdered sugar and vanilla. Don’t add the powdered sugar and vanilla until you have gotten all the lumps out. You can really let it mix like crazy as much as you want to before you add the powdered sugar and vanilla. 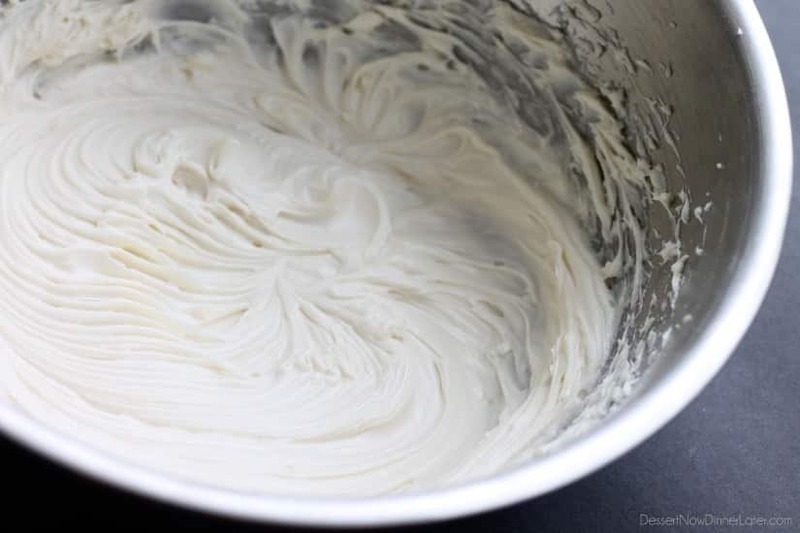 If it helps to soften the cream cheese, and then make the frosting, you can do that, but you may need to refrigerate the frosting to stiffen it up a bit before you use it for spreading on the cake. This is amazing. Would it also work with mascarpone?? Hi Shannon, I’m not entirely sure it would hold it’s structural quality with the mascarpone, but you could try it. Also you would want to do lemon juice instead of vanilla to mimic the tang of the cream cheese. Let me know if you try it, and how it works out! Hello Sandy! Sometimes, depending on the brand of butter, it will be more yellow. Glad it still tastes good! You can try substituting shortening for the butter and putting in 1 tsp of butter extract to get a whiter frosting. Hi Amber, I am wondering how many days in advance you can make this frosting? I don’t like being stressed out and doing it all the night before. If you make it ahead, I would definitely refrigerate it. Pull it 10 to 15 minutes before you need to spread it on anything though. It lasts a good 7 to 10 days once you make it. I fixed it! Microwaved it and put it in the fridge and it was great! Oh good! I was thinking it could have been lumps from the powdered sugar, and to sift it next time, but I guess it was cream cheese lumps. Glad you worked it out! I completely agree! 😉 Thanks for stopping by! Just made this to top some girl scout rainbow cupcakes! Wow is it yummy – truly the best cream cheese frosting I’ve ever had and I’ve made a ton. Thanks for sharing! YAY! So glad you liked it! It really is our favorite cream cheese frosting! Hi, I used your recipe for some banana muffins. So easy and so, so tasty. About to use it again for my carrot cake. Thanks. Now it’s MY go-to frosting! Awesome! So glad you liked it! This is a good recipe Amber….not too sweet just what I needed for a Martha Stewart 4th of July Cake am playing with the piping as a beginner and using giant frozen berries and strawberry stars to see if they are going to get blue and red juice on the icing .. Learning wheat free cooking am 62 and this is a new learning curve a little intimidating..so I made a half a cake to practice on. For special family gatherings with grand kidz ,my go to raw honey recipe is similar but it would not get stiff delicious though just add almond flavoring to your white recipe was like wedding cake, and fair trade unsweetened cocoa powder to the chocolate. Glad you enjoyed it Penny! Have a great holiday weekend! That’s great to hear! Glad you liked it! Amber, will this recipe stand up to being airbrushed. some frosting recipes don’t do so well as the colors will run. I haven’t tried it, but I do know from another reader that it doesn’t melt in high humidity. Would this work for decorating as one might with buttercream? I’m wanting to decorate a cake with a star tip and want it to be firm, like buttercream. Does it crust? Or do you think adding a stabilizer may help? It will be firm and pipe well as long as you don’t go adding any extra extract/liquid to it. I even had a reader email me and say it holds up well in humidity too! When you say cold, do you mean just take the cream cheese out the fridge and mix? Or should you let it sit for a while at room temp? Yep, just out of the fridge. My mom uses this recipe all the time!!!!! Whenever she does, there is no leftovers. Best frosting recipe ever!! No leftovers at our house either! haha. Thanks Dani! 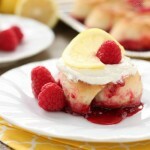 loved this recipe, not too sweet, just right! will use again. That’s fabulous! So glad you liked it Geri! I would double it for sure. That would give you roughly 3 cups of frosting to work with. Hi Amber, we’re having very hot dry weather in South Africa right now 31C (90F). Will this icing stand up to hot temps? I’ve had readers tell me that it holds up well in humidity. I haven’t tried taking it outside during the summer, but I think it would be okay for a little while. It does have butter in it, so it will melt eventually. The food coloring paste might be better than food coloring drops. Just be careful not to add too much liquid or mix it too long, because it may soften it too much. Good luck! That was my question too. I want to add some gel color for decorating the cake! Does the cake need to be refridgerated after using this frosting? And how long does this stay good before spoiling? Cream cheese frosting is an “either or” type thing. You can either refrigerate it OR leave it at room temperature (about 70 degrees Fahrenheit), but don’t take it from the fridge to room temperature several times or it may be unsafe to eat. So it’s your personal preference and your judgement call. I like mine room temperature, but I understand if it makes people nervous. As far as how long it lasts. I would say up to 5 days unrefrigerated and up to 8 days refrigerated. Enjoy! I was very pleased with the smooth & fluffy yet stiff texture of this frosting! The ingredients are the same as on the box of sugar except for half the sugar & the way to combine them. I needed strawberry flavor but didn’t want to change the consistency. I used a little unsweetened strawberry Kool-Aid & had to add 6 more Tbsp of the sugar. To give it the look & smell of fresh strawberries, I folded in 1/4 tsp strawberry puree. It was perfect! I was able to frost the two strawberry cake layers & the frosting stayed in place. Thanks for the creamiest strawberry cream cheese frosting I have ever made!! Love your alterations! Great idea with the kool-aid and strawberry puree! Is this frosting good and thick enough to hold under a fondant? After following another site’s recipe that involved whipping cream… I’m trying this next. Fingers cross because I am TIRED and almost out of ingredients to keep trying again. Who’d have thought finding a stiff cream cheese recipe would be so hard? Any ideas what to do with my “soup” from the “never peaked” batch? Maybe I’ll freeze it to make ice cream? Sad! Don’t give up! If this recipe doesn’t work for you, I would be SHOCKED! It’s the only recipe I use. I love it, and so do many people who’ve tried it. I think freezing your “soup” might be okay for ice cream. Kind of like no churn ice cream (which I have many recipes for on my blog). Throw some buttery graham crackers crumbs in it for cheesecake ice cream! Yum! Wow, this icing is seriously amazing! I followed the recipe exactly (though I did double it since I was making 24 cupcakes), and it turned out better than I ever expected!! I piped it onto cupcakes with no problem. It’s so delicious and amazingly smooth and creamy. The cupcakes are really just a vehicle for the icing 😉 I’ll never use another recipe! Thanks, Amber! This is a definite keeper! I’m so, SO happy you enjoyed this recipe Christine! Thanks for letting us know how it worked out for you! Hi! So I’m planning to use spreadable cream cheese (I wasn’t able to get a cream cheese block!) and was wondering if this recipe would still work and how should I change the recipe (if I do have to change it) so I get the right consistency? Your comment went to my spam, so I’m sorry for the delay in replying! I don’t think it will change that much with the spreadable cream cheese as long as it’s not whipped cream cheese, so go ahead and make the recipe as follows with the cream cheese you could find. I hope it works for you! I think if you used coconut extract instead of vanilla and then add the coconut, you will have great flavor and won’t mess with the consistency. Good luck! Wow! Thanks for the quick response! When I said I was in the middle of this, I meant it. I have already added the vanilla and a tad bit of lemon. Decided to just go for it by adding the bag of coconut, leaving some out to sprinkle on top. Fingers crossed. Done, and worked out fine. It would have been perfect if I hadn’t added the lemon juice. Don’t fix what ain’t broken! Well, I’m sure it was yummy anyway. 😉 Thanks for the update! Hi! 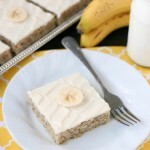 I’m kind of a novice baker, and I’m planning to make this icing recipe for a 9×13 lemon velvet sheet cake. Do you think this recipe will be enough, or should I double? Thanks! Hi Tricia! It will be a thinner layer. Maybe 1/4 to 1/2-inch. If you want it thicker, definitely double it. I’ve put it on a 13×15 jelly roll pan and it was quite thin. Tammi! Thank you so much for taking the time to leave your comment! I am so happy it turned out the way you wanted it to. Love your idea of using it for stuffed strawberries! Yum! Hi Amber, can I color this with gel coloring? Gel coloring should be fine, but use as little as possible. Let me know how it goes! Hi Amber, not so well. I’m going to try adding it this time before I put the powdered sugar in. Trying to get Crimson red for a Grooms cake (Roll Tide:). I will let you know how it does. Thank you so much for your reply! Shoot! Did adding it first help at all? HOw does this recipe hold up in an outdoor event? Like a park birthday party or patio shower? I live in Texas and it gets hot here and I would really hate it to “melt” into a heap if it adorned some carrot or red velvet cupcakes…Thanks! Hi Michelle, I have had readers tell me it holds up well in humidity. Not sure about Texas heat. I would definitely keep it in the shade and serve as soon as possible just in case. Good luck! Let me know if it works out! Hey I was wondering would this cream cheese frosting be good to use on a strawberry half sheet cake ?? Hi Dynasty! Yes, absolutely! I have used it on strawberry cupcakes and it was delicious! You may want to double the recipe if you plan on frosting the sides, but if you are just doing the top, you will be fine with the recipe as is. HI! I’m very new to baking and I’m making cupcakes for a birthday party. I’m a little scared. If I were to make this frosting and pipe it on the cupcakes the night before would I need to refrigerate the cupcakes because the frosting would spoil or is it okay a room temp like other icings? The weather where I live has been around 70 degrees so not too hot out side. I would appreciate any help you can give. Thank you! Hi Amy! If you are taking the frosting outside, I would refrigerate it, but if you are keeping it in an air conditioned house you will be fine. I usually keep mine at room temperature. It will only spoil if you took it from the fridge, outside, then back in the fridge, then outside. The drastic change in temperatures several times will do that, so pick which way you prefer, and then keep them in that temperature. Thanks Amber! I piped the cupcakes right before the party and the icing worked perfectly. Your recipe was super yummy too, everyone loved it. Oh great! That’s wonderful! Thanks for the report back! Hello, can I pipe this recipe onto cupcakes? Will it hold up overnight in the fridge? Absolutely! It’s always piped well for me, and it is fine to store in the refrigerator or at room temperature, just pick whichever is your preference. Good luck! Hi Amber do you think I could replace the butter with shortening for a super white frosting? I made it recently with room temperature cream cheese but see that your recipe says cold cream cheese. Can you explain why it should be cold? You could try it, but it won’t taste as good. You can use clear vanilla and maybe throw in a little butter extract too. I prefer cold cream cheese to keep the consistency of the frosting from going too soft before I get to pipe it. If you use shortening, you may not have that problem because it doesn’t melt like butter does. This frosting is perfect! It is not too sweet. I have been looking for a cream cheese frosting that is not too sweet. Thanks! I’m so glad you feel the same way! Thanks for your comment Debra! You weren’t lying, this frosting is truly AMAZING. I may have licked the beater, and the spoon, and the bowl, and the spatula….. 🙂 I wound up being short half a stick of butter (my chocolate beet cake took more than I remembered!) and it worked out great anyway! I’m sure the flavor was a bit less buttery and more cream cheesy, but that was OK with me! I think its the ratio of sugar and cream cheese that makes it so good. The recipe made the prefect amount to frost between the layers of the cake. I probably could have done the top too if I wanted, but I prefer thick frosting between layers, and I just use powdered sugar on top. I can’t wait to dig into the cake! Other frostings I’ve used have been overwhelmingly sweet and you lose some of the earthiness of the beets, but I think this one will be perfect! That is great news Lindsay! I’m so glad this frosting worked perfectly for your beet cake! I’ve never tried that before. Sounds tasty! I know you blogged about this a couple of years ago, but was looking for an easy cream cheese frosting and found this. And it came out great. I did add some pumpkin spice as I was using on a pumpkin cake. Yes this is the heat of summer but the sky is over cast and looking fallish like, sooo. It was perfect for my cake. I bet that was so good with the pumpkin spice in it! It’s never too early for pumpkin recipes. 😉 Thanks for your comment Bonnie! Amber, I am making someone a birthday cake today. I always make her a strawberry cake with strawberry cream cheese frosting. Last year she says prefers a non sweet frosting. Well, not sickening sweet. You know the cream cheese frostings usually have tons of confectioners. So I guess she wasn’t loving the frosting I was making :). This one sounds perfect. I have fresh strawberries. 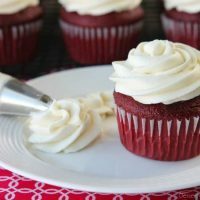 Can you help me to adapt your recipe to a strawberry cream cheese frosting? My recipe definitely isn’t overly sweet, so it sounds like you came to the right place. As far as adapting it to make it strawberry cream cheese frosting, You can add try adding 1 Tbsp of strawberry puree to the recipe. More than that will most likely make it soft and stringy. Good luck! Thanks so much! It came out really nice. I had a few frozen strawberries, let them thaw, mashed them with a fork and added to your recipe. Nice color and taste. I’m sure she’ll love it. Thanks again! I’m so glad it worked out well. Thanks for coming back to let me know how it went! Store bought cream cheese frosting is just too sweet so I was so happy to find a recipe with so little sugar! It’s exactly the flavor I want. It’s so good with pumpkin cookies that I stopped in the middle of frosting them just to tell you how good they are. Thank you! Comments like this make my job totally worth it! I love to share my recipes, and I’m so glad you liked this so much to stop frosting cookies to tell me! Totally made my day! Thanks for your comment Jess! I added cocoa powder (just plain old Hershey cocoa powder) and it was delicious!! I also added a touch of milk just to make it more spreadable (for a birthday cake). Glad to hear it! Thanks for your review! How would I make this chocolate frosting. What would I change and add. Suggestions? You can just add some cocoa powder. Start with 1 Tablespoon and go from there. Can i double the recipie without doubling the amount of sugar to froast between and around a three layered carrot cake?Will less sugar affect the consistency,while i dont want the froasting to be so sweet? If you double the recipe and don’t double the sugar it will be quite thick, and probably not spreadable. I promise this is very lightly sweet. Most other cream cheese frosting recipes use double, triple, and even quadruple the amount of sugar I have in my recipe. Doubling this recipe would give you 3 cups of frosting to work with. I just googled how much frosting you need for a 3 layer cake and it says: “It takes about 2½ to 3 cups of icing to generously fill and frost a two-layer 9-inch cake. For a three-layer cake, plan on using 3½ to 4 cups.” So I would consider tripling the recipe just to be safe. Hope this helps! I added sour ceam to increase the tartness, about 1/4 cup. I increased the sugar to accommodate. Awesome! Sometimes lemon juice instead of vanilla does the trick too. I made this for my red velvet cake for my grandma’s 90th birthday and it went down a treat. I will be saving this recipe for sure. Thank you! Wonderful! Thanks for your feedback Ann! You can start with 1/4 cup and taste it. 1 cup of powdered sugar is really small compared to other recipes and it’s just the right amount of sweetness in my opinion, but you can absolutely start small and go up from there to how you want it to taste. Thank you. I will try that and let you know 🙂 How long is it stable once made. I would like to do a trial run but don’t want to wait until too close to the party in case it doesn’t work for me. Also how much would you multiple the recipe by to frost 20-24 cupcakes and one jumbo cupcake made in the wilton pan? I typically double this recipe to frost 24 cupcakes, but lessening the sugar will lessen the amount of frosting too. Definitely triple it. I have also stretched this frosting with cool whip. You can try doing that with whipped cream too. I would do about 1 cup whipped cream per batch if you want to try that out. I hope it works out for you! Will it double or triple easy? Yep! I quadrupled it once too. This really IS the best cream cheese frosting I’ve ever tasted! I’m so glad you feel that way Meg! Thanks for your comment! How much frosting does this make? Enough to frost a 4 layer, 8 inch cake? It makes 1 1/2 cups. You would definitely need to at least double it for a 4 layer, 8-inch cake, maybe triple it depending on how much frosting you put between the layers. I made a cupcake boquet today for the first time,red velvet cupcakes,and this is the frosting that i used,even after adding a few drops of coloring it is still easy to pipe,😊.I love that it is not too sweet,thank you for sharing the recipe.It really is the best cream cheese frosting. What a fun idea! I’m so glad you liked the frosting! I doubled the recipe and covered the whole cake very well. I however did not have enough time to make a crumb coat first so it was just one thick-ish layer. Loved this so much!!! Good to know! Glad it worked out and you liked it! Hi there. Quick question… I know the recipe calls for cold cream cheese, but my mind is so used to room temperature butter for frosting, that cold cream cheese seems counter-intuitive. I’m feeling a little paranoid and just confirming that the cream cheese should be cold, not room temperature? Thanks! You can do either or, but I feel like the frosting is more firm with the cold cream cheese. Adding the butter a little at a time helps to keep the frosting smooth and not lumpy, even though the cream cheese is cold. Good luck deciding! Thank you sooo much for this recipe. I’m making carrot cake for the 1st time today & while I know how to cook, I am NO Baker. The recipe I had called for 3 cups of confectionery sugar & another one said 4. I appreciate you taking the time to explain step by step & I’m glad I read the comments first, because I would of used the whisk attachment instead of the paddle. I also added in a drop of lemon extract as someone suggested & doubled the vanilla, because I love it. Licking it off the paddles now. Delicious! Now lets hope the carrot cake comes out great as well. Thank you so much for your comment Colleen! I’m so glad you like it! Is it better to use a paddle attachment instead of a whisk attachment? I prefer a hand mixer, but sometimes you need a combination of both the paddle and the whisk attachment to get all the lumps out. Try to get all the lumps out before you add the powdered sugar. Hi. Tried your recipe for the first time today. Tastes great. All was smooth and creamy until after I added the powdered sugar. I don’t think I over beat it. It is lumpy. What did I do wrong? Hi Diane! I’m guessing your powdered sugar was lumpy. You can try sifting it before you add it next time and that should do the trick! ok. Thanks I’ll give that a try. ok, made the frosting again. sifted the powdered sugar and still lumpy. not sure what’s going on? It sounds to me that the cream cheese and butter weren’t whipped long enough, before the sugar was added. You can put cream cheese and butter in the microwave a little to soften. If they are both soft, and whipped together well, there should be no lumps in the frosting. I agree with Bonny. Make sure you are beating the cream cheese and butter really well before adding the powdered sugar and vanilla. You can try adding a little sugar at a time as well. Are you using a hand held mixer or a stand mixer. And if you are using a stand mixer are you using the whisk or the paddle attachment? I prefer a hand held mixer for this recipe like the one pictured. It seems to get the lumps out better. You can also try room temperature cream cheese and butter. I just like mine a little cold still so it pipes better. I hope you can get it figured out! As a few previous posters have commented above, I rarely leave comments. But this definitely warranted a comment. It was SO GOOD!! Thank you SO much for sharing. Exactly what I’ve been looking for in a cream cheese frosting!!! These are my favorite type of comments! I’m glad you loved the recipe so much! Thanks for taking the time to leave your review! I just wanted to clarify, the recipe calls for 8oz of cream cheese right? Not 8 cream cheese. Yes, 8oz. So sorry about that! I just got new recipe cards and they didn’t move everything over properly it’s fixed now. Keen to use your recipe, I’m from Australia, what quantity is 8 cream cheese? 8 ounces of cream cheese. Sorry, my recipe card is new and some of the formulas didn’t get moved over right. Absolutely! Do a quick test batch so you can play with it first, but it should work great! Also, if you want it to be more white instead of cream colored, use clear vanilla extract. Good luck with the wedding cake! Hi I was wondering if I need to leave the cream cheese at room temp beforehand? Thanks! Hi Tess, I keep my cream cheese cold from the fridge. It helps keep the frosting firm and pipe-able. Would it be possible to use this frosting for a cake that is being covered with fondant? Its going to be a bit of a heavy cake with 3 to 4 layers, and will it be okay to sit out of the fridge for a day after covered with fondant? I bet if you keep the layers thin it will be fine. And the frosting is okay to sit out of the fridge. I usually don’t refrigerate it. Let me know how it goes! I found your recipe last year and love it! My favorite icing has always been cream cheese icing so I’ve used this recipe at least10-12 times since I found it and always get compliments on how great it tastes, thank you for sharing it! I love this frosting!! I’ve used it on Christmas cupcakes and again for cupcakes I made today. It’s so easy to make and everyone loves it!! I’m so glad! Thanks for sharing your review Nancy! Can I substitute butter with high ratio shortening? Possibly. I would add a little butter extract or something to help the flavor though. Yum! This was so good on my carrot cake. This is the best cream cheese frosting ever. So-o-o-o good. That’s great news Linda! Thanks for sharing your review! Thank you so much for sharing this recipe! It’s absolutely delicious and perfect on the chocolate cake we (my Grandson, age 7, and moi) made last night. Next time I’ll use your Red Velvet recipe for sure. The cake just went out the door with said Grandson’s Mom for their large-ish family. She said “Dessert first might just happen tonight”!! Wonderful! I’m so glad you enjoyed this recipe Gini! Thanks for your comment! Hi Mila, I’m sorry, but I’ve never heard of that. You can try using clear vanilla to help it be more white, but the butter will still make it slightly ivory in color. You could also try doing half of the butter and substituting the other half with shortening or coconut oil. Good luck! Great news! I’m so glad you enjoyed this recipe Sabrina! Can I use half butter and half margarine? I’ve never used margarine, but you could try it. I’m sorry you are having a hard time. I would maybe try high quality products. Name brands for both butter and cream cheese. See if that helps. You can try refrigerating it before piping too, but you really shouldn’t need to. since i live in singapore, i use french butter and royal victoria cream cheese. i left both at room temperature before using it. Ok. I have it stated in the ingredients list to use cold cream cheese. That should help. yep, i tried both batches, one with cold cream cheese and another with room temperature. it still doesnt work out for me and its still shiny and glossy and unable to hold its shape well. I don’t know what else to recommend. Apparently our products are made differently in the U.S. I’ve never had a problem with this recipe. I’m sorry I can’t help you more. Amber, you’re very kind to share your recipes and respond to everyone who comments. I’d like to use your cream cheese frosting on a very large hummingbird cake for my mother-in-law’s 100th birthday. It would have two round layers in each of three tiers, 12″, 9″, and 6″. What I wonder is whether you think that I can bake and frost the tiers individually with this frosting, then freeze them for a week or two before the birthday party, and then take them out of the freezer and assemble them for decorating the day before the party. Also, I wonder whether the layers should be filled with something other than the frosting, and whether any flavoring other than vanilla would be good for hummingbird cake. I’ll appreciate whatever hints you can give me. BTW, I’m a 67-year-old grandfather, I babysit for twin 16-month old grandsons twice a week, and my mom taught me to bake cakes when I was about nine. Her lessons stuck–I still love baking. Thanks for sharing a little bit about you. I love to hear about my readers! Cream Cheese Frosting is very classic with hummingbird cake, so I think vanilla would be a great flavoring. Unfortunately, I think if you frosted the cakes and froze them with the frosting, the cake would effect the frosting as it thaws to an undesirable texture. You can definitely freeze the cakes and frosting separately. Or you can freeze the cakes and make the frosting fresh the day of or a day or two before. (I would recommend refrigerating the frosting if you make it early, so it lasts longer.) Hope this helps! Good luck with your mother-in-laws cake! Thank you, Amber. I’ll give you a report on my results. I’ve used this recipe a few times but I really don’t understand how you can make the frosting stiff with such less powdered sugar. I don’t overbeat it either. Also most recipes usually cream the butter first to avoid the lumpy bits at the end. This is exactly what happens when the cream cheese is beaten first. Yes it does taste good but very sloppy. I have made this recipe at least 30 times and it’s never “sloppy” for me. In previous recipes I’ve made, the more powdered sugar I would add to cream cheese frosting, the more stringy and soft it would be, but feel free to adapt it to your needs, especially if you aren’t in the U.S. Try different methods and amounts to get something that works for you. This has just always worked for me, so I’m happy with this recipe the way it is. I’m wondering why you use cold cream cheese vs room temperature, so it would be easier to blend? And can you use room temp and have it still work? Thanks for a great post. I find the frosting stays stiffer if I use cold cream cheese. If you use a hand mixer, it beats smooth really well. I just did the cream cheese frosting…its so perfect as I wanted.💜 Tq for the recipe. Awesome! Thanks for your comment Jayn! WOW! I have had many cream cheese frostings and My families number ne complaint is that they are never Cream cheesy enough and too sweet! This is a simple basic recipe! SOOOO perfect! I m thrilled to find it. Thank you for sharing!!! Wonderful! I’m happy you are enjoying this recipe Niki! Hi Amber, I had to write to let you know that your recipe is truly the best cream cheese frosting I have ever made or eaten! Everyone loves it! Your instructions were easy enough for me to understand and follow. So a big thank you for this!! I am going to bake my soon-to-be 4 year old granddaughter’s BD cake. She wants strawberry frosting for her chocolate cake so naturally I thought of your recipe. What do you think about me adding some fresh strawberries? I’m thinking about 1/4 cup pureed strawberries, straight up, and adding it to your recipe for color. I thought perhaps of chopping up more strawberries and adding it just before frosting, and setting it in the fridge to stiffen up. Think it would work? Thanks, Amber! Hi Dawn! Glad to hear it! If you can find freeze dried strawberries, that would be best so it doesn’t add any extra moisture to the frosting and make it runny. Just throw a handful of freeze dried strawberries into the food processor and make a powder with them. You can alternately use strawberry gelatin powder (jello), about 1-2 tsp. I have only ever added orange zest/juice to this recipe, and it did make it softer, so I’m nervous about fresh strawberries. You could try fresh strawberries if you want, but try to make it and then serve it right away so it doesn’t get the chance to macerate and release the juices. Let me know how it goes! Dear Amber, Thank you for your quick and helpful response. I was afraid the fresh strawberries would make the frosting too wet so I will try the freeze-dried suggestion for sure! I can always put fresh strawberries as a decoration, right? To make the frosting red, powdered strawberries should do it, right? But if not enough color, I could try the gelatin suggestion. I’ll experiment. I will certainly let you know! Thanks, again, so much! If you use a hand mixer like mine (in the video), it will be just fine. If you are still worried, you can let it get to room temperature, but it may not be as pipe-able. If you aren’t piping anything, then you shouldn’t have anything to worry about. Ok I think I do have the right attachment. Definitely want to pipe! If too soft, I’ll fridge / freeze for a bit. THANK YOU! Have you ever added peanut butter? I haven’t. You could probably substitute some of the butter with peanut butter. You may need to add extra powdered sugar. Good luck! I’m so glad you got around to making it, and that you loved it so much! Hi! This looks absolutely delicious. Would it be possible to add white chocolate to the recipe? I haven’t tried it, but you may need extra powdered sugar. Good luck! I’ve done that for my Rainbow Cupcakes and it is good! I have found that adding a bit of cornstarch to the powdered sugar before adding to cream cheese allows me to pipe the icing. I start with 1 teaspoon of cornstarch to the 1 cup of confectioners sugar. After blending, allow the mixture to sit for 15-20 mins. Living in Alabama, we are very humid and frequently must add cornstarch to icings. ( I sift together the confectioners sugar and cornstarch for even mixing.) Hope this helps. Agar agar also helps to stabilize whipped cream and frostings. I add it to all my buttercreams so they stand up to high heat. I made this icing today and people really enjoyed it! My issue is that I made way too much and I don’t want to waste it. Is there a way to successfully freeze it? I personally haven’t frozen it, but from what I am reading online, it should be okay to freeze. I haven’t tried yet BUT picked your recipe for the rv cupcakes because it’s exactly the same as mine minus the butter which I’ve been wanting but hesitating to use. Why? Because BUTTer 😁 I will def lyk the verdict later. Meanwhile, thanks for the recipe! I love cream cheese frosting but I want to be able to pipe some really tall, pretty cupcakes using a 1M Wilton piping tip for an upcoming special event. When you say this recipe is pipable, is it as light and pipable as regular frostings or is it heavier (and possibly better for lower profile piping)? Thanks for sharing your expertise with us! I am using a Wilton 2D tip in the photos and video. The texture is somewhere in the middle. Not super light, but not dense. It’s definitely pipeable. I piled it on pretty high at the beginning of the video. You’ll have to use your judgement. You could always do a small batch to test it out. I’ve used this recipe twice and it’s been a huge hit. However, my daughter requested chocolate cream cheese on her birthday cake this year. Would adding cocoa powder be enough? If so, how much? Yes, anywhere from 1/4 cup to 1/2 cup of cocoa powder can be added. Just keep in mind that cocoa powder is bitter and with the small amount of powdered sugar used in this recipe, you may want to use less over more. Thank you for the recipe Amber, this really is the best cream cheese frosting of all time. Not too sweet, not too cheesy, perfectly smooth and delicious. 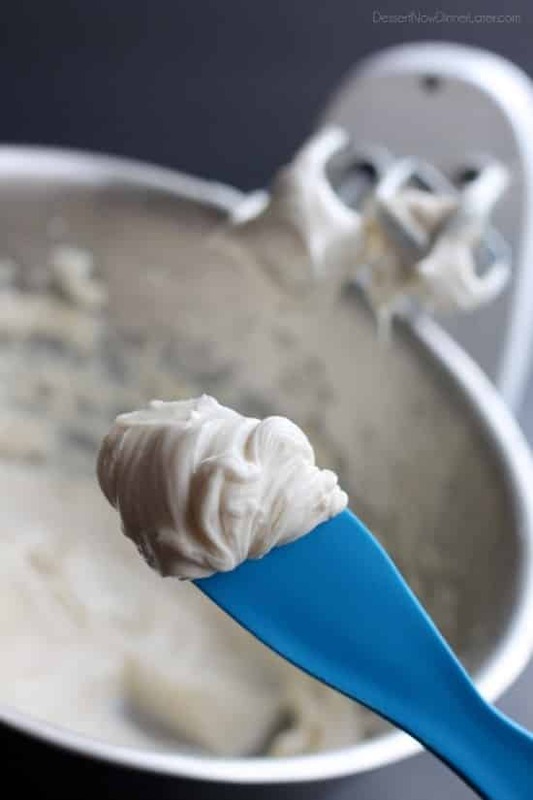 I have used the recipe dozens of times over the past couple of years and in a world of infinite choice, this will be my forever cream cheese frosting recipe. Many many thanks. I’m so glad you feel the same way I do about this recipe! Thanks for letting me know your experience with it! I have a question on this too, (now that’s I’m typing it, it seems silly and obvious) does the butter have to be room temp still? It’s just the cream cheese you use cold? Yes, I like to have the butter soft, and the cream cheese cold.